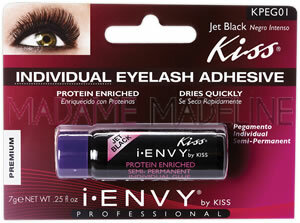 Kiss I-Envy Individual Eyelash Adhesive Jet Black (KPEG01) semi-permanent individual lash glue (3.5g, .125oz) is enriched with protein; perfect for placing individual lashes exactly where you want them, without damaging your own lashes. 1. Using tweezers, gently remove a trio lash from tray. This is a very good adhesive in terms of staying power. It gets tacky really quickly, applies easily, and doesn't budge or move. The applicator wand is very nice instead of the standard squeeze tube. Even with watery eyes, my falsies do not budge. This lash glue is dark so it acts like an eye liner. Supper cool and stays strong all day long, just tough to get off.. You only really need a thin layer of it. It stays on all day!